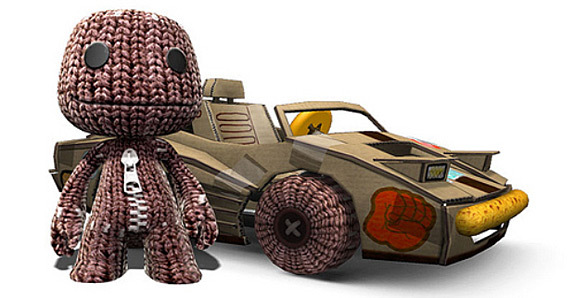 Sony have released a trailer and some new details about their upcoming arcade racer LittleBigPlanet Karting. United Front Games are developers behind this project, which seems logical as they developed the Modnation Racers series which was already seen as the LittleBigPlanet of racers. UFG have said they will be putting as much time and effort into this as they did with Modnation Racers. The game seems to be very similar to Mario Kart and Modnation Racers. With the usual racing modes and Multiplayer races and battle. There also seems to be a bunch of different mini games. One of the mini games shown in the trailer was throwing eggs into holes to score points. With a fully fledged track editor likely to outshine Modnation Racer's own editor. Racers can fully customise their vehicles quite similar to Mario Kart 7. The vehicles are all made out of cardboard and have a nice look to them. LittleBigPlanet Karting is shaping up to be a great little arcade racing game for PS3 (No news on vita release) and will be hitting shelves later this year.